Lets be honest, the weather has been terrible. Causing chaos across the United Kingdom. Some parts of Scotland and the north have been without power for days, tree’s have come down, roof’s have blown off and chimneys have collapsed. It’s enough to make you want to stay in doors, but if you do have to venture out whether to walk the dog, pick up the kids or nip to the shops, are you wearing the right attire? Some winter coats are thick and warm but do not offer any protection against harsh winds and rain. Duffle Coats are a great pick when you need something to protect you against the elements. Worn for decades, these fantastic coats are made from a specially woven wool fabric which is thick, warm protects against shower and also strong winds. The other great thing about Duffle Coats is their fit, you won’t feel like a restricted marshmallow, these coats allow movement and freedom which is perfect when going on a long walk or carrying shopping or children. Duffle Coats are very versatile, when made for the service men, they would not only wear them but use them as cushions to sit on and blankets to cover them. It’s an all round winner. So rather than braving the outside in something thin and returning soaked to the bone and cold, consider a Duffle Coat for the winter, especially in this weather. 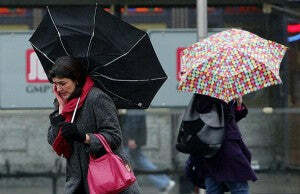 Returning to the weather, the UK is set for another windy period, with winds reaching up to an incredible 100mph. So batten down the hatches, get some candles in and that gas camping stove up from the shed, because its going to be a rough ride. If the heating goes, make sure everyone has a Duffle Coat, you’ll be glad you invested.